My monthly goal should be simple. New machine needs a cover to keep the dust off. Of course that requires some sort of a plan or idea. Mr Google can you help this quilter out? Yes sirree he did I looked at a ideas on pinterest, so many ideas floating around right now. I need to narrow it down and come up with a pattern and answer a few questions before getting started. Do I want applique? Do I just make a cover with ties on the side or an overall cover? Use patchwork or use up some orphan block pieces? Maybe a scrappy cover? I pulled a couple fabrics for the cover. Wish me luck! Linking up to Red Letter Quilts OMG. Oooh - I can't wait to see what you dream up Cindy! With your favorite color as a start, it is sure to be pretty! Glad Mr. Google didn't snow you under too badly on the ideas! 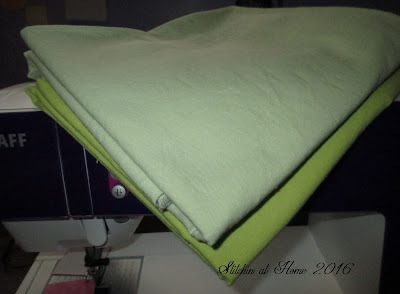 Will look forward to whatt you make; you would collapse in laughter if you saw my longarm machine cover....no, it's not Bella. Sounds like a great goal Cindy. Looking forward to seeing your completed cover.